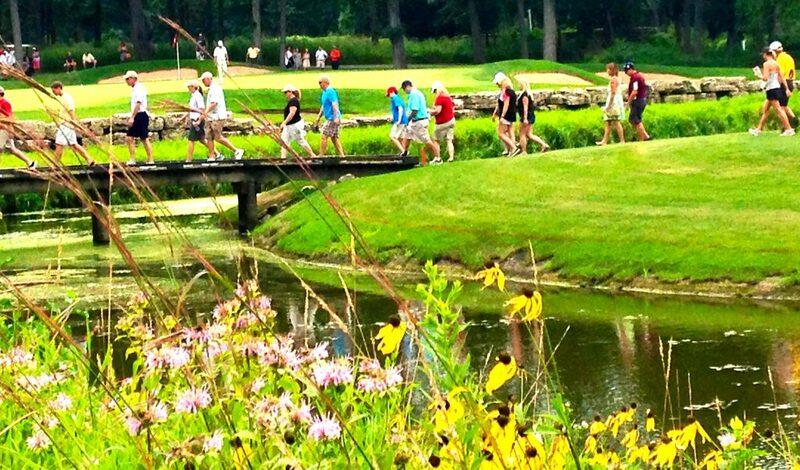 Spectator march was ongoing at the tense Western Amateur final at Rich Harvest. 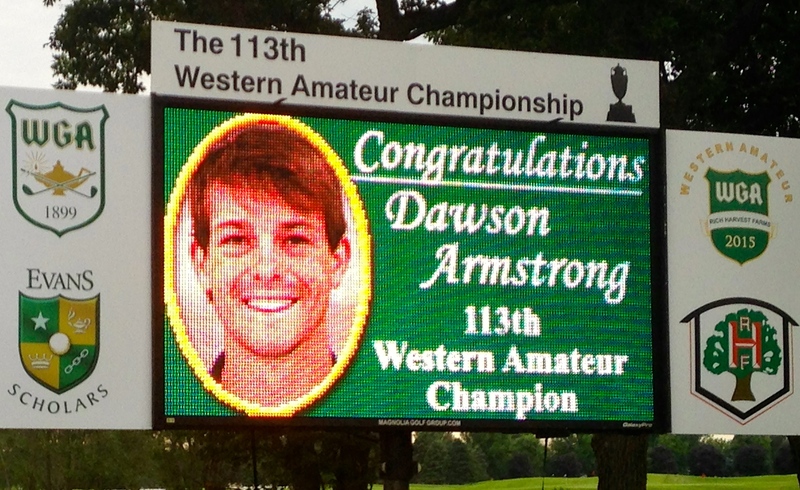 Dawson Armstrong and Aaron Wise were unlikely finalists – maybe even Sweet 16 qualifiers – when the Western Amateur teed off at Rich Harvest Farms last week. Then again, nothing much was usual in the 113th playing of the championship put on by the Western Golf Assn. Armstrong earned the title with a miracle bunker shot on Saturday after eliminating two of the pre-tourney favorites – 2013 champion Jordan Niebrugge and this year’s medalist, Robby Shelton – in match play. 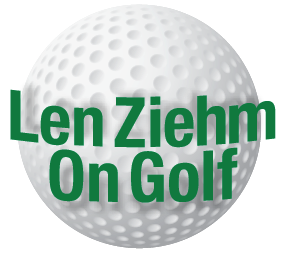 Wise, barely past his freshman year at the University of Oregon, set the course record with a 64 in the stroke play portion of the five-day tournament and had to finish the event carrying his own bag the last six holes. His caddie, 2013 Western Junior champion Colin Morikawa, had to leave after 14 holes of the title match to catch a flight home to California. 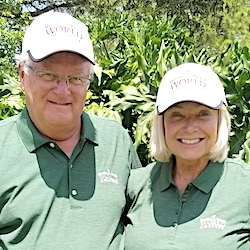 “That didn’t make a difference,’’ said Wise, who endured 72 holes of stroke play plus three matches and most of the fourth with Morikawa on his bag. Finally it’s over. Champion Dawson Armstrong celebrates his dramatic victory. What did make a difference – and a huge one – was Armstrong’s play in the clutch. A student at little Lipscomb College in Nashville, Tenn., Armstrong was one-down going to the 18th hole of the championship match. He stayed alive when Wise three-putted to lose the hole. That sent the match to sudden death, and it ended dramatically at the par-5 second hole. Wise was safely on the green in two shots and facing a 25-footer for eagle. Armstrong, for the second time in the match, put his second shot into a greenside bunker. His caddie – for the first time in about five years — was his father Dale, a veteran of golf’s mini-tours who played nine times in the PGA Tour’s Qualifying School. “When we got to the ball my Dad said that I’d hit a lot of great shots, but none had gone in,’’ said Armstrong. His next one did, the ball diving into the cup after one bounce. 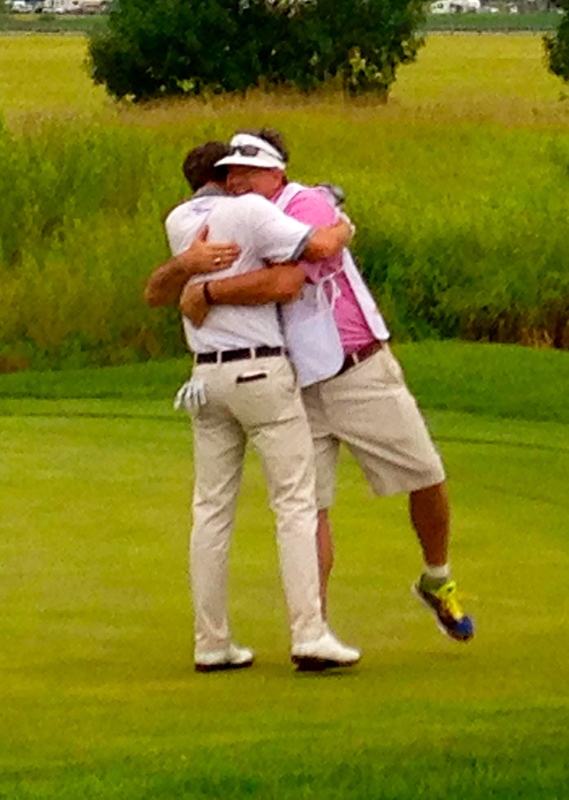 Dawson and Dale Armstrong made a great father/son and golfer/caddie combination in the Western Amateur. 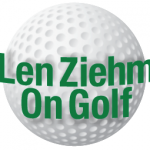 He couldn’t connect, however, and that brought an end to the tournament in which neither Niebrugge, the low amateur in this year’s British Open, nor defending champion Beau Hossler were around at the finish. They, along with Wise and Shelton, will be back for the U.S. 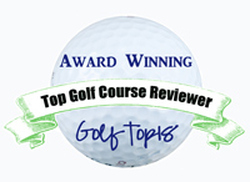 Amateur at Olympia Fields in two weeks. Armstrong wasn’t among the qualifiers for that one, but he was a giant-killer at Rich Harvest. His 2 and 1 win over Shelton in Saturday morning’s semifinals was as big as his upset of Niebrugge in Friday’s quarterfinals. 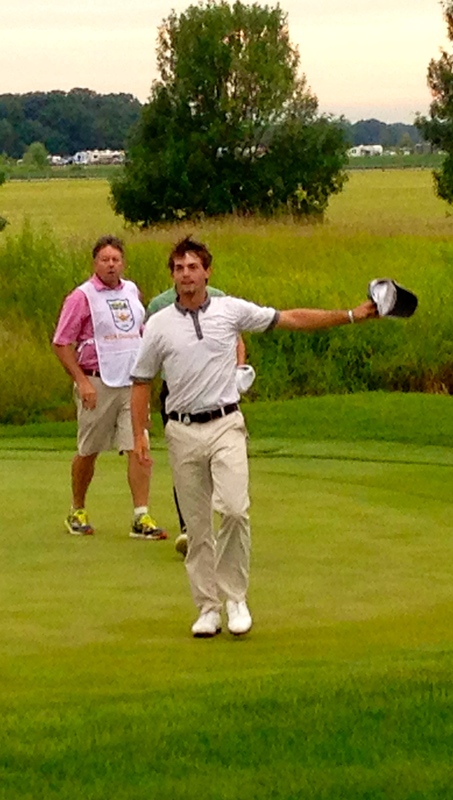 Armstrong also had a big shot against Shelton, a chip-in for birdie at No. 13. Wise had an easier time in the morning. He was 4-up on a fellow California resident Jake Knapp at the turn before putting him away 4 and 2. After a five-day endurance test at Rich Harvest the scoreboard said it all.